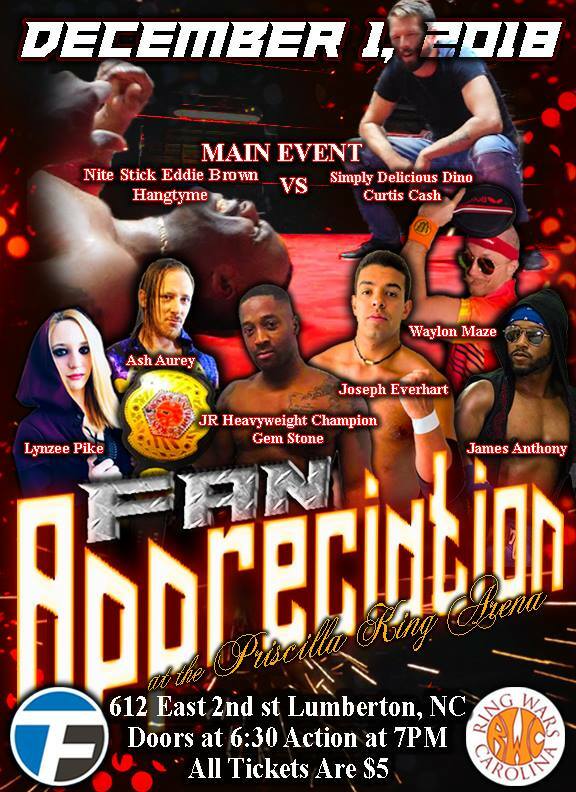 Ring Wars Carolina: Next Event: "Fan Appreciation 2018"
Next Event: "Fan Appreciation 2018"
Showing the fans that Ring Wars Carolina always appreciates them, All Tickets are just $5 dollars. Come see just what the former commish DJ Primetime has put together. He joined forces with Simply Delicious Dino and together, brought back the biggest surprise of the night, Curtis Cash! Thanks to Hang Tyme helping Eddie Brown from a 2 on 1 beating. A main event tag-team match has been made by the New Commish of RWC, Mr. Hall of Famer Earl Hebner! Gonna be there for this one! See the New Jr. Heavyweight Champion, Gem Stone in his 1st title defense. Plus more to end 2018 and to start 2019. Priscilla king arena, 612 2nd st in Lumberton NC on December 1, 2018! 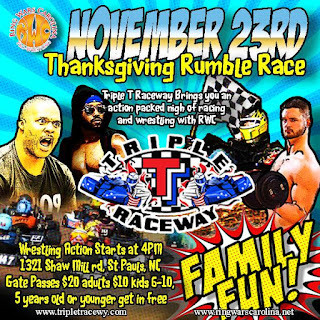 Next Event: "Thanksgiving Rumble 2018"
New RWC Champions are crowned!